No entiendo por qué no funcionó. No hay errores. Quieres tratar de nuevo. Lo dejé por probar. Did you arrange a time to play with him? I thought you were playing earlier in the week but kept missing each other? As fun as this game was (for me), it wasn't one of the best that Leven and I have played. The tiles were definitely on my side and as Leven began to feel the game sliding away from him he took increasingly risky chances which never seemed to pay off. As nice as it is to draw all the tiles that I needed, as well as the ones that Leven needed, it didn't feel like a very balanced game and although I was very happy to take the win I did feel that if this had happened during a game in person I could rightly have been accused of rigging the tiles! This was quite a long game (it took about an hour) with lots of contemplations from both sides. Leven was always quick to leap on any opportunity to block one of my meeples and although I was usually able to defend myself I was always on the back foot with regards my meeples as Leven always seemed to have more at his disposal than I did. This said, I never completely ran out so didn't skip too many points. In the end, the luck was fairly evenly balanced with both of us picking up most of the tiles we needed (significantly the final cccr for Leven). This meant the scores were generally close throughout; often there were just a few points between us. In the closing stages of the game I was ahead by a handful of points, but had two farms to myself and was sharing the top farm with Leven. With three tiles left to place he attacked this farm and won it outright with the last tile of the game which secured him a 2-point victory. 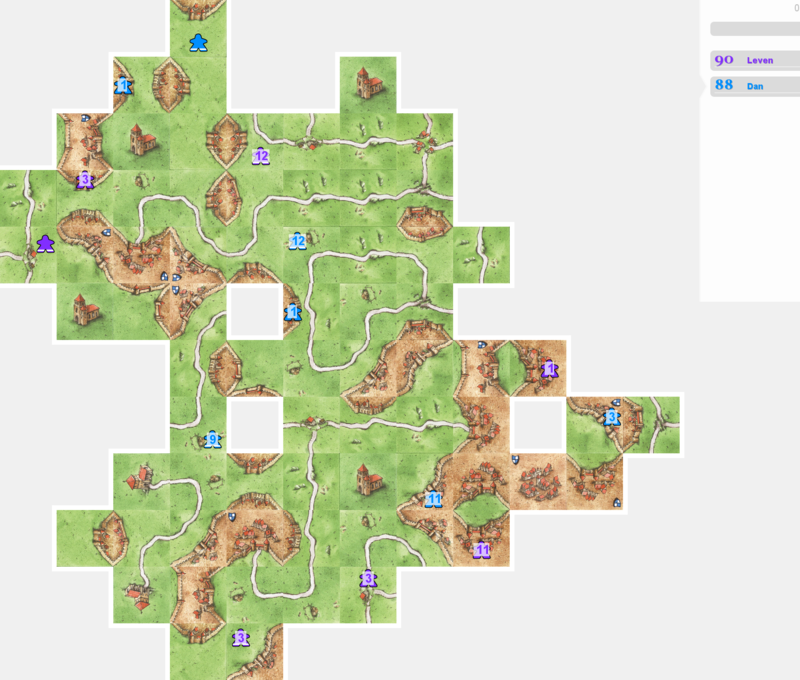 LaplazadeCarcassonne - please let me know when you have some time to test your instance of JCloisterZone. I am working from home today so have time between now and 3pm, or this evening. Please let me know. If JCloisterZone worked for you before when you played Leven then it should be working just as well now. Gracias dani por tu ayuda! El viernes se han acordado las dos partidas de la segunda ronda. Sorry for the delay everyone, but things are back on track! 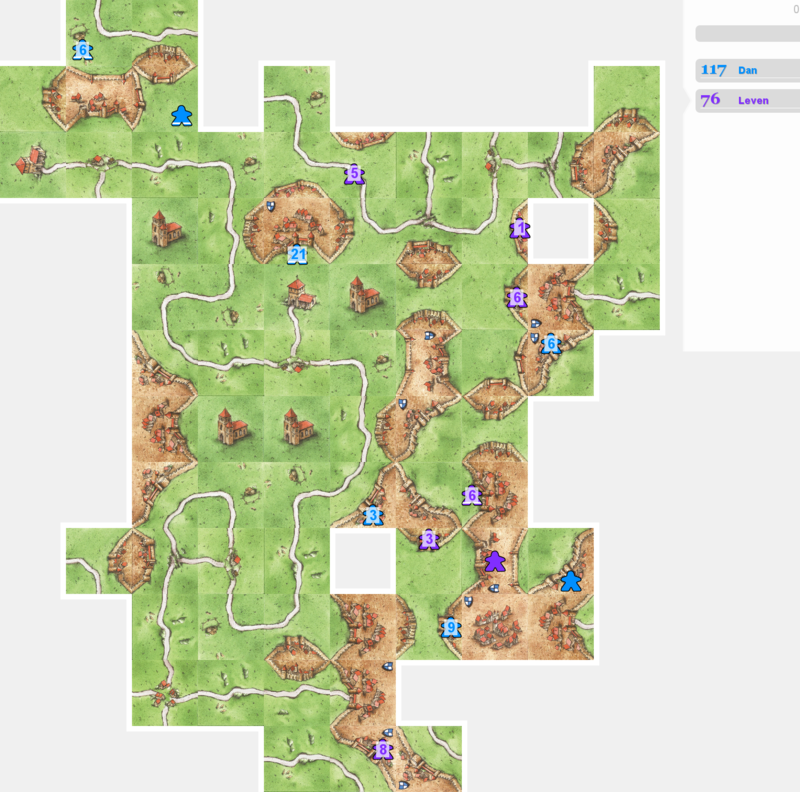 LaplazadeCarcassonne is back in the mix now that we've resolved his difficulties with JCloisterZone and he is due to play his match with Halfling on Friday. Meanwhile, the long-awaited clash between Rosco and Sinscerly is scheduled to take place this evening! All being well I'll kick off Round 3 at some point over the weekend. 20:00 UK on Friday, appreciate you hosting us Dan. Yes, I finally could the web let me play!